Originally from the Rio Grande Valley, I am currently living in the great white north. I missed the smoked brisket and polish sausage I grew up with so a few years ago I bought a low-cost offset smoker and set off on a new hobby. The learning curve was steep but once I learned how to keep the process consistent the results have been fantastic. 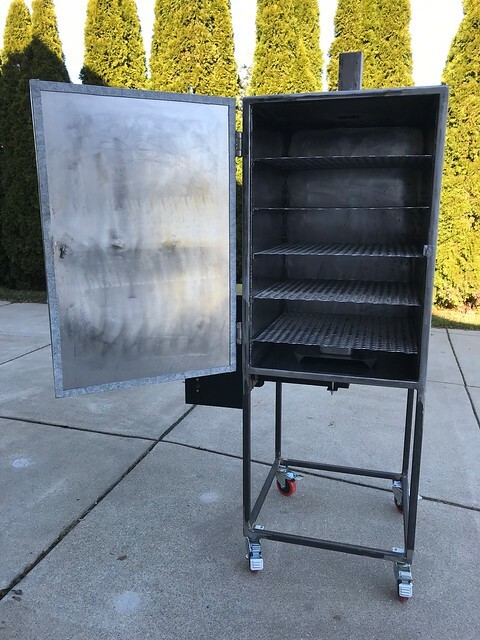 These past few years I have improved my tools by adding a pellet feeder in place of the off-set fire box, and most recently by building my own vertical smoker from scratch. I'll post that project on the forum, but here is a picture of it unfinished. This forum is full of great information and I hope to make a meaningful contribution to the discussion. We are dreamers, shapers, singers and makers. Welcome TimS, my wife just returned home from there. She is from Hartland outside of Milwaukee. Milwaukee is a great blue collar town. Good luck with your cooking up there in cold country. GRailsback wrote: Welcome TimS, my wife just returned home from there. She is from Hartland outside of Milwaukee. Milwaukee is a great blue collar town. Good luck with your cooking up there in cold country. I live in a small town called Vernon about 20 miles from MKE, and work in Pewaukee which is next door to Hartland. After moving up here from TX I had to learn weird new activities, like ice fishing and sledding. Good news though, they have Shiner Bock up here.. They also have spotted cow, which is a very good local beer up there. I have some of it here in my ice box as well. I also have a brother in law that lives in pewaukee. And the Butler in of peewaukee is a very good restaurant. Oh yeah! I miss fried catfish all right. They say the walleye up here is the best, but to me it is just another light white fish. Fried okra is hard to find too, but I have my sources. I got some Texas gulf shrimp thawing in the kitchen right now, need to throw them on the grill. Yee haw!